I hope you find great value in these Quotes about Travel from my large collection of inspirational quotes and motivational sayings. the moonlight amid the mountains. I do not wish to go below now. other states, other lives, other souls. deep and permanent, in the ideas of living. you are more likely to play first class. The hardest part is to travel, and to be away from your family. Traveling is seeing; it is the implicit that we travel by. I travel not to go anywhere, but to go. I travel for travel's sake. The great affair is to move. travelers don't know where they're going. You get educated by traveling. you weren't late, you weren't nauseated by the food. can never repeat the same experience. by all the conjectures and descriptions in the world. When the traveler goes alone he gets acquainted with himself. The time to enjoy a European trip is about three weeks after unpacking. Traveling is the ruin of all happiness! There's no looking at a building after seeing Italy. Travelling expands the mind rarely. of water and eat light and healthy food. and though fast rooted, they travel about as far as we do. I never make a trip to the United States without visiting a supermarket. To me they are more fascinating than any fashion salon. I think a major element of jetlag is psychological. Nobody ever tells me what time it is at home. is not undertaken without money. and remember more than I have seen. Just got back from a pleasure trip: I took my mother-in-law to the airport. I love short trips to New York; to me it is the finest three-day town on earth. Travelers repose and dream among my leaves. but I love art, and I love food, so I am the perfect traveller. with different cultures and different people. not only in our country but around the world. the North Pole by dog team. There will be too much open water. and love, and understanding companionship. they say, forgetful of the shadow's speed. a shapeless dust cloud invades the continents. Travel is fatal to bigotry, prejudice, and narrow-mindedness. 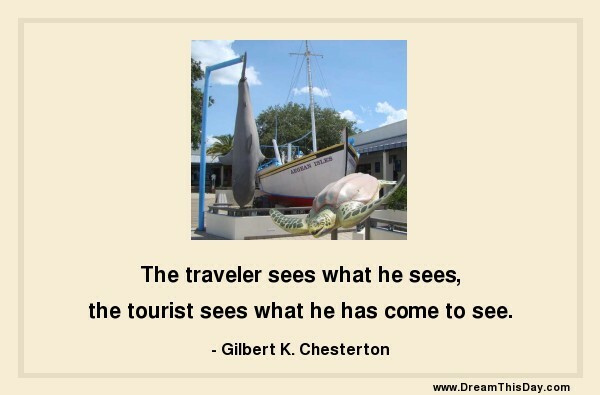 Thank you for visiting: Travel Quotes.